It's starting to feel a bit like fall here in Menlo Park - which always brings to mind cooking roast chicken in the oven. We're mostly wintertime roast chicken people - not wanting to bother with it during the summer. But as we get into the fall season, and the days cool off, roast chicken comes to mind as one of our weekend dinners. 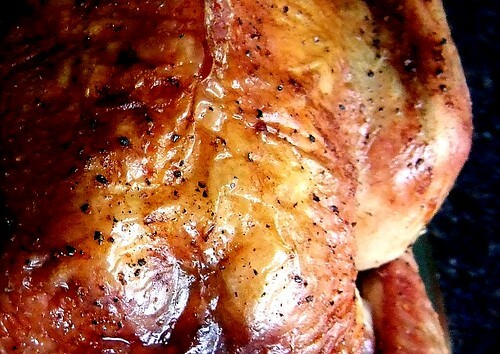 I recently came across this simple roast chicken recipe from Mark Bittman. Click through for the recipe and also a link to one of his Minimalist videos where he shows the technique. It's a really simple recipe. His key breakthrough was discovering that the use of a cast iron skillet for roasting the chicken helped balance having the white/dark meat cooking appropriately. He recommends putting the skillet into the oven when you first turn it on - and use a high heat (he suggests 500 degrees which our oven won't quite reach!). As the oven warms, the skillet warms up with it - so that when the chicken is put into the skillet to cook, the warm skillet will help the thighs and dark meat cook a bit faster while letting the breast meat cook normally. It's this orchestrated imbalance that provides the magic to his recipe. Give it a try for one of your weekend dinners! A couple of weeks ago, I came across Elise Bauer's recipe for "Mom's Ground Turkey and Peppers" on her outstanding Simply Recipes web site. We made the recipe and enjoyed it very much. This afternoon, with family company coming, we needed to put something quick together for Saturday supper - and, as it turned out, we had a package of ground turkey in the fridge. So, we tried a new variation on Elise's Mom's ground turkey recipe - using these ingredients we had on hand - along with an 8 oz can of Muir Glen Tomato Sauce that was in our pantry. The result was great - in about 20 mins - with a bit more liquid/sauce than in Elise's original recipe. We served it over a package of Trader Joe's brown rice - so easy to cook in 3 mins in the microwave. Very tasty indeed! A friend said he was making braised chicken for a family get together tonight - which naturally got me interested in exploring recipes for braised chicken! I came across one - a modified Food & Wine recipe - at The Kitchen Sink. I've always loved apple cider - and this one looked interesting. So, we made our own version earlier this evening and really loved all of its flavors. We paired the chicken with some sauteed vegetables with a splash of balsamic vinegar and fresh lime juice - yum! Yesterday, for our New Year's Day dinner, we tried a different take on Hamersley's Roast Chicken recipe - one of our all time winter favorites. If you're ever in Boston, you just have to go get the real thing at Hamersley's Bistro! This is one of my all-time favorite quick meals - you can literally walk in the door and have a wonderful hot and healthy meal on the table in less that ten minutes! And, Trader Joe's would be happy - all of the ingredients come from there: Fire Roasted Vegetables in Balsamic Butter Sauce (frozen), Organic Brown Rice (frozen), and Just Chicken (fresh chicken pieces). Add a splash of Chardonnay (a current favorite is the Olivet Lane Estate Russian River Valley Chardonnay from Pellegrini) and you've got a delightful, fresh, and very tasty stir-fry. Serves 2-3. Everyone needs an everyday roast chicken recipe - and this is ours! It a minor adaptation of the original by Gordon Hamersley, chef-owner of Hamersley's Bistro in Boston -- as published in Fine Cooking magazine. We lived in Boston over 15 years ago and used to love hitting Hamersley's Bistro for this roast chicken dinner! We were back in Boston in 2007 and enjoyed another lovely edition of this dish!